The little one...and she's reading the 4th book already- Harry and the Goblet of Fire. 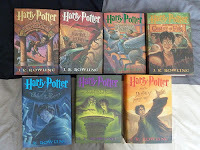 I've read all the Harry Potter books myself. I didn't start reading them until the second or maybe, the third book came out. Thanks to a former co-teacher ~ a Vietnamese who grew up in Great Britain ~ who gave me a knock-off copy of the first book in 1999 [?]. From then on, I was one of the many who patiently waited for the next books to come out. Anyway, I've had 5 of the 7 books on my bookshelf, 4 of which I bought as they came out while one I bought in a flea market a couple of years ago. I've always wanted to complete the set so I've been planning in buying the other two that I didn't have yet but without hurry. When the little one suddenly got interested in reading them I decided to find used copies of the two I didn't have ASAP. Why? Because the ones I didn't have were Books 1 & 2. I want her to start reading the books in order. She's just too impatient to do that so she started reading book 3 while waiting for the other 2. She finished the first 3 books in litte under a month. Now I'm wondering how fast she's going to read the rest of the series. I'm guessing faster than I can imagine. I should probably start collecting some other books, eh? How nice naman that E loves reading books! At ang bilis nya magbasa!! Katuwa! Dito naman, ang mahilig sa pocket books e itong babae. Mlapit na syang matabunan sa room nya ng mga books. Until she got her galaxy tab and onto e-books. Maganda ba talaga yang mga Harry Potter books na yan Huling? Para kasing di ko sya type e. Sabi ni Janina, di daw kasi ako in. Hala! sa edad ko pala, kailangan pa maging in. Lol! Have a blessed Holy Week! Take care!